You know when you are craving something delicious but are absolutely too lazy to make anything yourself? Marshmallows? Why, hello there! So nice of you to show up. I was beginning to worry I might starve. I was lacking major creativity, so the hubs and I just stood in front of the stove and "roasted" marshmallows on the burner and then made mini S'mores with some leftover graham crackers and chocolate bits. Hardly culinary, but it was sooo good and satisfied my sweet tooth. 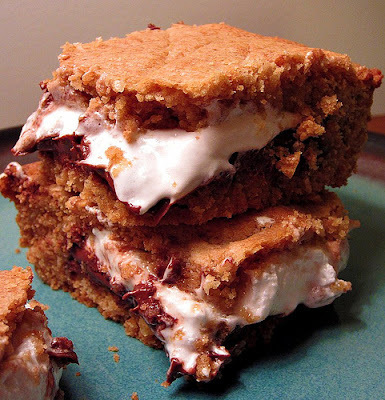 This got me to thinking about bringing S'mores back to the blog. 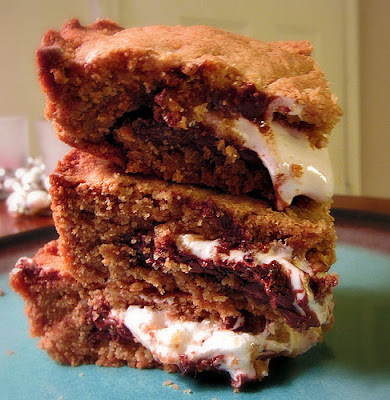 My most popular post to date is still the S'mores Cupcakes I did way back when. So it's time for a throwback! This time in "bar" form! 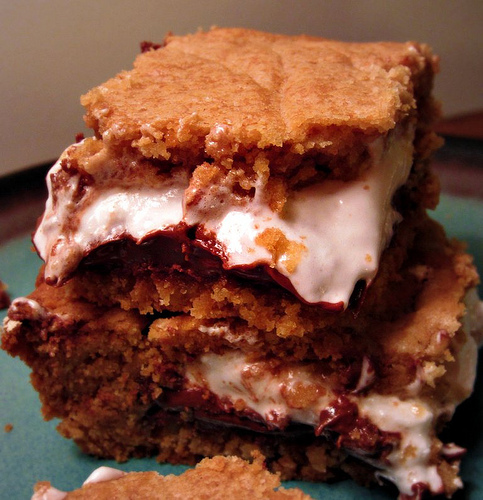 The recipe is simple, easy to follow, and the result is super fantastical. You just pop these puppies in the oven for 30 minutes and be amazed by their awesomeness. Preheat oven to 350. Grease bottom of 8 x 8 pan. Divide dough in half and press half of dough into an even layer on the bottom of the prepared pan. Place chocolate bars over dough. Two 5 oz. Hershey’s bars should fit perfectly.